David Lumpkins, co-founder of our predecessor, is responsible for formulating and executing our business strategy as well as providing general executive oversight of our managerial and commercial activities. Mr. Lumpkins has had a key role since the initial conception in the development and execution of the plan to develop the facility now owned and operated by the Partnership. Mr. Lumpkins has been affiliated with Lindsay Goldberg since 2000, during which time he has worked on a number of investment opportunities in the petrochemical and energy mid-stream industries including Lindsay Goldberg’s prior investment in PL Midstream which he helped initiate and served as Chairman. Prior to his affiliation with Lindsay Goldberg, Mr. Lumpkins worked in the investment banking industry for 17 years principally for Morgan Stanley and Credit Suisse. 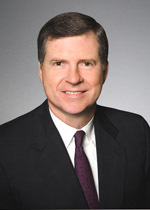 In 1995, Mr. Lumpkins opened Morgan Stanley’s Houston office and served as head of the firm’s southwest region. Mr. Lumpkins also serves on the board of directors of Crestwood Midstream Partners LP. He is a graduate of the University of Texas where he also received his MBA. Mr. Lumpkins’ extensive experience in the petrochemical, energy midstream and finance industries adds significant value to the board of directors of our General Partner.